Last Sunday we saw how Jesus’ public ministry began in John’s Gospel – with the miracle of turning the water into wine at Cana – emphasizing the gifts of transformation and extravagant abundance in Jesus. This Sunday our sermon text from Luke’s Gospel in 4:14-21 has Jesus’ public ministry begin very differently. 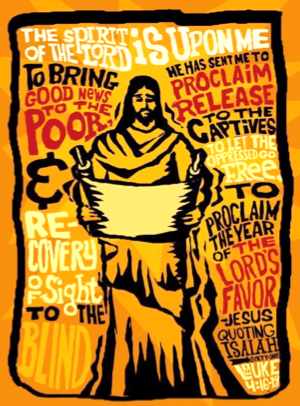 Sometimes considered Jesus’ first sermon (some called it the “Nazareth Manifesto”), Jesus quotes words from the prophet Isaiah to launch his mission, and “good news to the poor” is pretty much it in a nutshell. One commentator describes this text as “One of the most ignored, watered down, spiritualized or glossed over texts” in many churches today. I wonder if you agree? How – and why – do we do this? How do we join in Jesus’ purpose today? There’s a lot to talk about this week! So, I wonder if the biblical literature and practice of lament might help us out a bit – by encouraging us to tell the truth about our situation to God, and preventing us from burying our feelings and having to act like it’s no big deal, and ultimately by helping us get to a place of deeper trust in God.